Dr. Christopher Green and his team of Estero chiropractors frequently see patients suffering from hip pain and related symptoms. Hip pain can stem from a number of potential causes. It's important to observe the type of pain you're experiencing (dull, achy, or sharp) and the location of the pain. (Are you also experiencing discomfort in the thigh, inside the joint, groin, outside the joint, or buttocks?). Often patients suffering from hip pain may actually have sciatica, lumbar disc herniation, or other conditions in the lower back causing radiating pain in the hip. Arthritis: Conditions like osteoarthritis and rheumatoid arthritis cause inflammation in the hip joint, as well as the destruction of cartilage cushioning the bones. Arthritis causes pain to develop slowly overtime. Bursitis: The hip joint is filled with sacs (called bursae) which protect the muscles and tendons with movement. Overuse and sports injuries can cause these sacs to become inflamed. This is typically felt as pain on the outside of the hip. Tendonitis: As another type of sports-related hip pain, tendonitis refers to inflammation of the tendons and muscles is typically caused by overuse injuries. Muscle or tendon strains due to overuse or repetitive strain injuries. 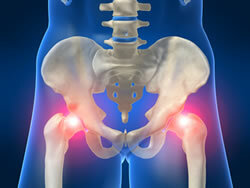 Hip Fractures: Older adults are especially susceptible to hip fractures. Bones become brittle with age, and at the same time, your sense of balance is compromised due to other age-related causes, putting you at a high risk of falls. Femoral Neck Stress Fractures: Athletes and runners may also suffer from femoral stress fractures, which are experienced as severe pain in the front of the hip, sometimes with radiating symptoms in the low back and thigh. Symptoms are often exacerbated with landing and jumping. If you suspect you have a hip fracture or femoral neck stress fracture, avoid activity that places strain on your hip and see a doctor as soon as possible. Our Estero chiropractors will identify the source of your hip pain, and use gentle chiropractic adjustments, massage therapy, and exercise rehabilitation to restore mobility in your hip. If you're an athlete with hip symptoms, we can design a rehabilitative treatment plan to prevent future sports injuries, while allowing you to return back to your sport as quickly and safely as possible. If you're an older adult with arthritis, our gentle, non-invasive treatments will allow you to regain better range of motion and slow the progression of arthritic pain. For effective hip pain relief in Estero, Bonita Springs, Naples, Fort Myers, and San Carlos Park, FL, call Chiropractic Care and Rehab Center today.